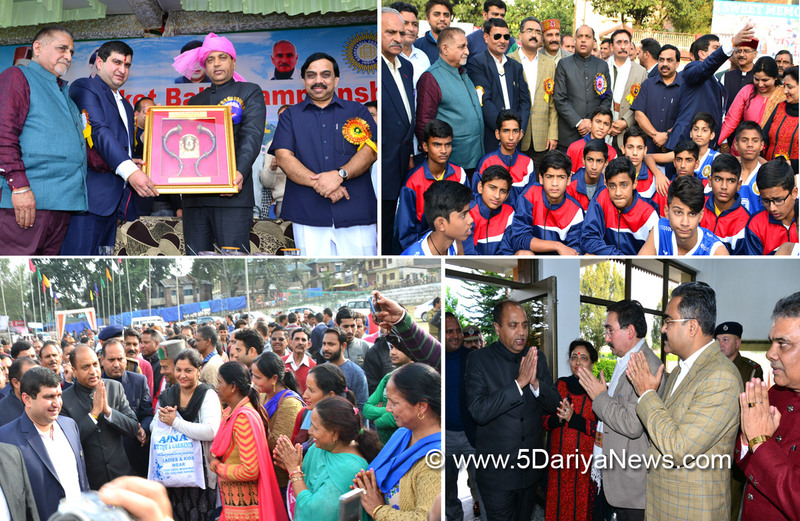 While presiding over opening ceremony of 45th National Basketball Championship of Sub Junior Boys and Girls organised by the Himachal Pradesh Basketball Association at Kangra today, Chief Minister Jai Ram Thakur said that an indoor stadium would be constructed at Kangra for ensuring best sports infrastructure in the region for different sports. He said that sports infrastructure would be created in the State, especially in the rural areas so that the youth could get opportunity to show their talent.While lauding the efforts of the State Basketball Association for Organizing this event in the State, Shri Jai Ram Thakur said that this event has drawn over 600 sportspersons to exhibit their talent. He said that the State Government was committed to promote sports activities in a big way. He said that Basketball was quite popular sports in the country as well as in the State. He said that such events provides an opportunity to the young talents to exhibit their sporting skills, so that they could excel at national and international level. Chief Minister said that the State of late has started to make its presence felt in sports activities at national and international level. He said that quite a number of youth of the State has brought laurels to the State by their performance at highest level. He said that drug abuse was a major area of concern for all of us.He said that sports activities not only help in channelizing the youth energy in creative activities, but also help the youth to stay away from this social evil. He urged the youth, elected representatives and other NGOs to join hands to nib this social evil in the bud so as to save the society from this social vice. Jai Ram Thakur said that Lift would be constructed in combined office building(Mini Secretariat) Kangra to facilitate the people. He said that PWD Rest House Kangra would be expanded to facilitate the visitors. He announced Rs 5 lakh for renovation of the present basket ball stadium at Kangra. He also announced Rs 5 lakh for Organizing this championship.Health Minister Shri Vipin Singh Parmar said that not only in the developmental front the State was committed to emerge as a major state of the country in producing outstanding sportspersons under the leadership of Chief Minister Shri Jai Ram Thakur. He said that several schemes have been launched by the State Government for welfare of every section of the society.President Basketball Federation of India and MLC Karnataka Shri K. Govind Raj appreciated the efforts of the State Basketball Association for Organizing such an event in the State. He said that the Sub Junior stage was vital for the any sports events as it was at his stage that youth chose sports as their career.President Himachal Pradesh Basketball Association Shri Munish Sharma welcomed the Chief Minister and other dignitaries present on the occasion. He said that as many as Forty eight teams of 24 states of the country were participating in this championship.General Secretary of the Association Ajay Sood presented vote of thanks.Captain of Indian Women Basketball Team Ms. Shia Mahajan administered oath of maintaining high sportsmen spirit to the participants.Urban Development Minister Sarveen Chaudhary, Industries Minister Bikram Thakur, Vice Chairman General Industries Corporation Manohar Dhiman, Chairman KCCB Dr. Rajiv Bhardwaj, MLAs Rakesh Jamwal and Ravi Dhiman, Former MLA Sanjay Chaudhary, Nagar Parishad President Ashok Sharma, Additional Principal Secretary to the Chief Minister Sanjay Kundu, Deputy Commissioner and SP Kangra were present on the occasion among others.